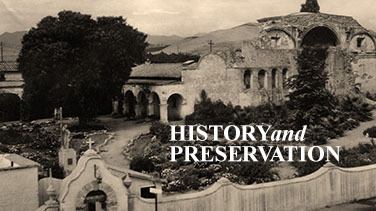 This is only a partial listing of Mission San Juan Capistrano’s archive collection. The Museum collection includes memorabilia and artifacts related to the American Composer Leon René (1902-1982). Much of this collection was generously donated to the Mission by Mr. René’s family. 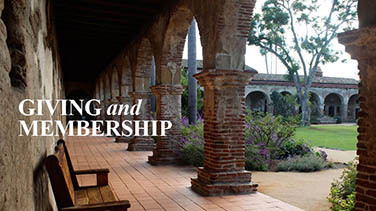 Famous for writing hit songs such as “Rockin’ Robin”, Mr. René helped breathe new life and interest to Mission San Juan Capistrano when his song “When the Swallows Come Back to Capistrano” became a hit in 1940. This photograph of Leon René was taken by photographer Thomas Y. Yee in 1946. This dramatic front page of the Los Angeles Evening Herald Express dated March 19, 1942, just months after the attack on Pearl Harbor, reports news from the events of World War II. 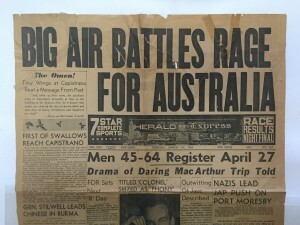 Included on the front page, directly below the headline about the battle for Australia is the news that the Swallows have returned to Capistrano! This photograph shows a Mass being held in the Great Stone Church around the year 1895. During this time the Mission had no resident priest. 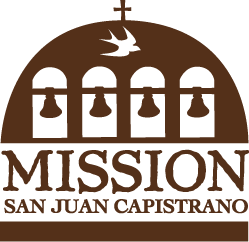 So, Administrator of Mission San Luis Rey, Father Joseph Jeremiah O’Keefe celebrated Mass at San Juan Capistrano twice a month. Photography is an important part of the Mission’s museum archive. These photos help document the history, condition and preservation of the Mission. 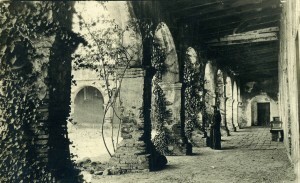 This photograph shows the Mission’s central courtyard, Serra Chapel, Sala and South Wing sometime around the year 1870. As the Mission began its identity as a tourist attraction in the early 20th century, postcards became a regular fixture as an item to be sold to visitors to generate money to preserve the buildings. These postcards are a significant addition to the archive collection because as a photography the document the history, condition and preservation of the buildings. This postcard is not dated but was likely taken in the early 1900’s. This vintage postcard pictures Reverend Arthur J. Hutchinson, pastor of Mission San Juan Capistrano 1933-1951. He stands at the entrance to the Mission c. mid-late 1930’s. 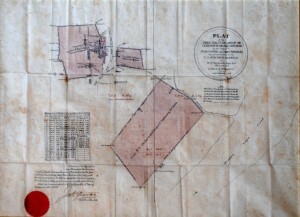 This map titled “Plat of the Three Tracts of Land of the Ex-Mission of San Juan Capistrano finally confirmed to Juan Forster and James McKinley” shows the property purchased By Forster and McKinley from Pio Pico in 1845. Interestingly, this map is signed by the U.S. Surveyor General and dated September 10, 1875, even though the Mission property had been returned to the Catholic Church by order of President Abraham Lincoln 10 years earlier. This is one of many very old books in the Missions archive. Some of the books in the collection came with the founding priests in the late 1700’s, others were collected or donated over the years. This book, “Sermones Various Que A Differentes Assumptos” by Fr. Andres de Amaya is dated 1723.